The new ghd curve classic curve tong set has been created to give you fabulous curls whatever your type of hair. New cutting edge technology developed by the team at ghd, will leave you with healthier looking curls that stay locked in for longer. Follow this simple step-by-steps guide to achieve classic curls with slightly flatter roots, dressed away from the face. 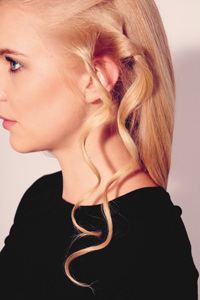 Take a section of hair above the ear, prep with ghd curl hold spray and twist away from face. Wind around barrel of the ghd curve classic curl tong and hold for 6-9 seconds then gently release, creating a sculpted curl. Repeat technique, making sure to curl hair in the same direction. With the front section of hair, start the twist from eye-level. Wrap hair around barrel and roll tong back up towards the root. Once you’ve finished use your fingers or the ghd detangling comb to soften the curl – Holding the tips, start at the ends and work your way up to the roots of your hair.